Some time means “a period of time”—usually a long period of time. 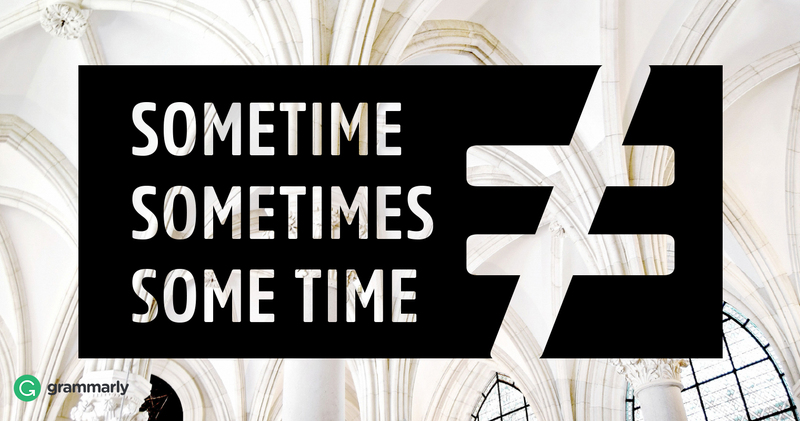 What is the difference between sometime and some time? And where does sometimes fit into the equation? Don’t worry, the answer is simpler than you might think. There are two ways to use sometime as one word. Let’s tackle the harder one first. When you use sometime as an adverb, it refers to an unspecified point in time. It doesn’t refer to a span of time—that’s what some time is for. Here’s an example of sometime used in a sentence. I’ll get around to finishing that book sometime . In the sentence above, we’re not talking about how long it will take to finish the book (span of time); we’re talking about when the book will be finished (point in time). You can usually replace sometime with someday or at some point when it’s used this way. I’ll get around to finishing that book someday . I’ll get around to finishing that book at some point . Give me a call sometime , and we’ll have coffee. We’ll announce a release date sometime soon. Tony needs to stop by the bank sometime today. OK, now let’s talk about the other way to use sometime. When you use sometime as an adjective, it just means “former.” Sometime should always be one word when you’re using it as an adjective. Albert, a sometime cab driver, now flies airplanes for a living. In the sentence above, sometime cab driver means “former cab driver.” Some writers use sometime to mean “occasional,” but that usage isn’t accepted by everybody. If you’re not sure whether your audience will interpret sometime as “former” or “occasional,” it may be a good idea to avoid the ambiguity and use more specific terms. And, remember, when you use sometime as an adjective, don’t put an s at the end of it. Albert, a sometimes cab driver, now flies airplanes for a living. For some time , humans have known that the world is round. In the sentence above, we’re talking about a long span of time—several centuries, in fact. That’s definitely a long time. For a long time , humans have known that the world is round. It will take some time to finish the project today. Again, we’re talking about a span of time, so some time should be two words. It will take a long time to finish the project today. Sometimes I just don’t understand what that man is saying. English grammar sometimes follows its own rules, and sometimes it doesn’t. Plenty of writers have trouble remembering how to use some time, sometime and sometimes. The good news is that once you understand the difference between some time vs. sometime, it gets easier to understand other tricky pairs like any time vs. anytime and any more vs. anymore.